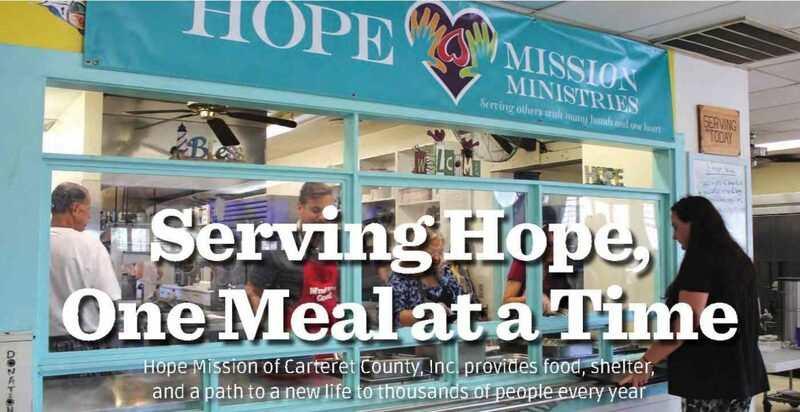 Transportation Impact (TI) recently featured Hope Mission of Carteret County in their Quarterly Review Magazine.”We are exceedingly grateful for all that Transportation Impact has done and continues to do for us; And we’re just ‘over the moon’ at being featured in their company magazine”, says Gene McLendon, Executive Director of Hope Mission. Below is the article that was published in “QReview” as the magazine is called. The entire magazine can be viewed here – the feature article on Hope Mission starts on page 6 in QReview. In 1990, the members of Faith and Victory Church in Carteret County turned their desire to feed their community into a mission they called Hope. Now, nearly thirty years later, the Church is no longer around, but Hope Mission continues to model and honor the example set by those church members. The mission is grounded in the Christian faith, but the services it provides are open to all and over the decades have expanded beyond hot meals. In 2017, the mission did the following: Almost 40,000 meals to folks living in the shelter and in the community helped dozens of people with substance abuse issues through a recovery program provided 268 families with some type of financial assistance, which many times meant the difference between them staying in their homes or being out on the street provided 164 men with shelter, support, hope, and, hopefully, a new start in life provided transportation for homeless women to neighboring counties with shelters and, in some cases, paid for motel rooms for them. In the summing up for 2018, that last statistic will be much lower. “I am very proud to tell you that, in February of this year, we opened a homeless women’s shelter in Carteret County,” says Gene McLendon, Executive Director of Hope Mission Ministries, adding that both the men’s and women’s shelters stay full nearly every day, with waiting lists on most days. This relationship between the family-run local corporation and the nonprofit began with a casual encounter three years ago between McLendon’s wife and two TI employees at a Leadership Carteret meeting. And on a personal level, he says, “Travis Burt has been an example, a friend, a mentor, and a teacher for me. TI has resources and knowledge that Hope Mission could never access or afford. Travis has counseled me and shared his knowledge and experience. He has helped a small, struggling nonprofit learn to develop leaders, add to our dream and vision, and learn about the business world. The value of his counsel will serve both me and Hope Mission for a lifetime.” For many TI employees, volunteering at the mission holds a special place in their lives and hearts. Along with food and shelter, Hope Mission also offers a priceless intangible benefit. “I believe that the most important thing we provide is a sense of belonging,” says McLendon. “Homeless folks and those that are on the edge or have substance abuse issues have lost their sense of identity. Much of the time that loss of a sense of identity is because of the disconnection from family and community. Over the years, McLendon and the staff and volunteers at Hope Mission have witnessed many people transform themselves and their lives. For instance, there was a young local man who had spent more years in prison than out who finally joined the mission’s recovery program. “He is now married, very involved in his church, and runs the most effective jail ministry in the entire county,” says McLendon proudly. Through the decades, Hope Mission has grown a little at a time, as the community could afford to help it grow, which means that the plans and dreams for other ways to help those who need it most sometimes require a bit of creative juggling and can take years to turn into reality. Hope Mission of Carteret County, Inc. is located in Morehead City, NC, and regularly holds fundraisers such as carwashes and an annual golf tournament to support its ministries. To find out more or to sign up for the newsletter to stay informed of all the things going on with the mission, visit www.hmcm.org or follow Hope Mission on Facebook at facebook.com/HopeMissionofCarteretCounty.